Morton’s neuroma, which may also be referred to as interdigital neuroma, is the term given to a painful inflammation in the foot. The pain from Morton’s neuroma commonly occurs between the third and fourth toes but can also occur between the second and third toes. Morton’s neuroma typically develops as the result of an injury, excessive pressure, or irritation. Pain from Morton’s neuroma typically radiates through the ball of the foot directly below the affected toe or toes. What parts of the foot are affected by Morton’s neuroma? The nerves within the feet run through the foot and toes between the long bones of the feet that are known as metatarsals. Each of the foot nerves split at the end of these metatarsal bones and continue to run out to the end of the toes. 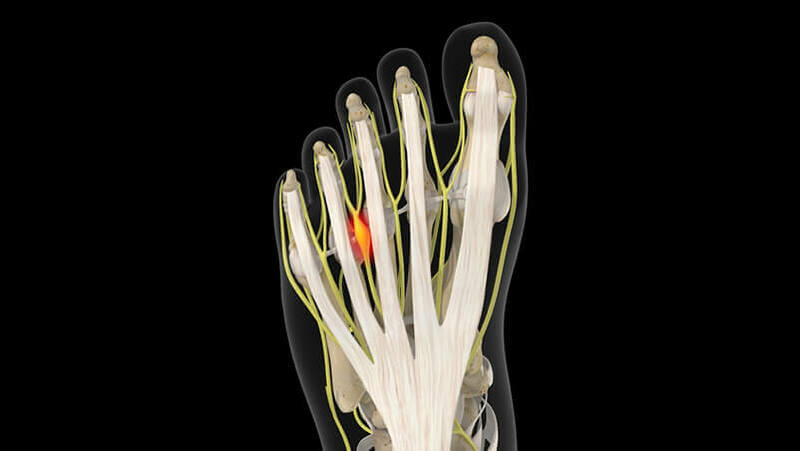 Each of these nerve endings provides feeling and sensation to 2 toes. Morton’s neuroma occurs within the nerve prior to the nerve dividing into the 2 separate branches. A neuroma is when this part of the nerve becomes inflamed and thickens. Morton’s neuroma seems to be a response to excess pressure or constriction of the foot’s nerves. Injury and irritation of the toes and feet may also lead to the development of Morton’s Neuroma. Certain factors may make it more likely that you will develop Morton’s Neuroma. Patients who wear tight shoes, narrow shoes, high heels, or pointed shoes may be more at risk for interdigital neuroma, as the pressure of these shoes can disrupt the nerves. Certain activities or sports that involve repeated stress on the ball of the foot (ex. sprinting) may also cause Morton’s neuroma to develop. Finally, a history of foot conditions like bunions may lead to a higher potential for developing Morton’s neuroma. What are some common Morton’s neuroma symptoms? One of the most common Morton’s neuroma symptoms is a pain in the ball of the foot below the toes. Another common symptom of Morton’s neuroma is a painful catching or locking sensation in the foot while walking or jogging. Sharp pains that radiate out to the 2 toes where the nerves extend is also commonly seen in patients with Morton’s neuroma. Some patients even report feeling as though a pebble is stuck within their shoe as they walk. Inflammation, tenderness, and redness may also form on the ball of the foot. How Can Dr. Rozbruch diagnose Morton’s neuroma? Dr. Rozbruch can usually diagnose interdigital neuroma with a physical examination. During this physical exam, Dr. Rozbruch may apply pressure to the foot to feel if there is a growth or excess tenderness on the ball of your foot. X-rays of the foot may be helpful to determine if your symptoms may be due to another medical condition. Ultrasound technology is often used, as it is exceptionally useful when diagnosing conditions of the soft tissue, such as Morton’s neuroma. What Morton’s neuroma treatments are available? A common Morton’s neuroma treatment is to incorporate supportive footwear that reduces discomfort. In some patients, moving to a wider or more comfortable shoe may alleviate the pain of interdigital neuroma. A firm sole within a sneaker can reduce how much the foot stretches when walking, which can decrease nerve irritation and pain. Lidocaine or Cortisone injections for Morton’s neuroma can temporarily provide dramatic relief from symptoms. What Morton’s neuroma surgeries are available? For patients who don’t experience relief from a Morton’s neuroma treatment, Morton’s neuroma surgery may be beneficial. Morton’s neuroma surgery can help alleviate pain and inflammation in the nerve of the foot. There are a variety of interdigital neuroma surgeries available. Some common Morton’s neuroma surgeries are Morton’s neuroma removal and ligament release for Morton’s neuroma. One of the most common types of interdigital neuroma surgeries, Morton’s neuroma removal surgery involves removing the neuroma itself. Because Morton’s neuroma is part of the nerve, the nerve must be removed. An incision will be placed between the 2 toes that are affected by Morton’s neuroma. Once the neuroma has been located, it will be removed along with the nerve. Because the nerve must be removed, this will result in permanent numbness in the area. The incision will then be closed with stitches, and bandages will be applied. In some cases, removing the nerve itself may not be right for your individual case of Morton’s neuroma. Dr. Rozbruch may suggest ligament release for Morton’s neuroma to treat pain and inflammation. This surgery involves releasing a tight or rigid ligament between the metatarsal bones. By releasing this ligament, the compression from the metatarsals will be reduced, helping to alleviate the irritation of the foot nerve. Ligament release is often performed under general anesthesia to maximize patient comfort. Most patients are also able to return home the same day as their Morton’s neuroma surgery. What should I expect after a Morton’s neuroma treatment? Patients with severe Morton’s neuroma pain or those who cannot walk properly due to discomfort may need 4-6 weeks of physical therapy. During these sessions, your physical therapist may be able to suggest proper footwear to reduce any Morton’s neuroma symptoms. Shoe inserts and foot pads may be suggested, as they can also help to reduce discomfort and pain caused by interdigital neuroma. Physical therapy, comfortable shoes, and foot pads may help you return to pain-free walking quickly. Despite a lack of symptoms, it is important to not partake in vigorous activity for a period of time to not aggravate your Morton’s neuroma. What should I expect after Morton’s neuroma surgery? Bandages should be periodically changed for the first week after surgery to promote a healthy recovery. Patients may need to walk with crutches for a few days after surgery until they are able to place more weight on their foot. Dissolvable stitches will be processed naturally by your body, but if Dr. Rozbruch used traditional stitches, they will be removed within 10-14 days. How can I learn more about Morton’s neuroma? To learn more about Morton’s neuroma, please request an appointment online or call Dr. Rozbruch’s orthopedic office in NYC at 212-744-9857. Prior to an office visit, please fill out Dr. Rozbruch’s patient forms to expedite your first visit.